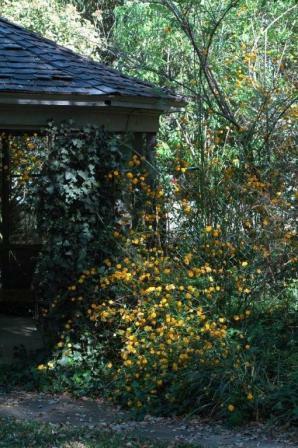 HABIT: Ornamental deciduous shrub maturing at up to 5' tall by 6' wide, arching clump growth habit, becoming rounded with age, rapid growth rate from its basal shoots, but slow growth rate from the established stems. Width can be 10’ or greater. Lots of slender twigs. Stems are upright to arching. Suckers freely. CULTURE: East to grow prefers a moist, rich, well-drained, slightly acidic soil in partial sun, but will tolerate poor soils, heat, drought, and various sun or shade conditions. Hardy to zone 5. FOLIAGE: Alternate, simple leaves 1 ½ - 4” long emerging with bright medium-green color and changing to dark green as the season progresses. Deciduous, alternate, ovate to lanceolate, doubly serrated, with sunken or impressed veins and an acuminate apex. Usually keeps color into November. 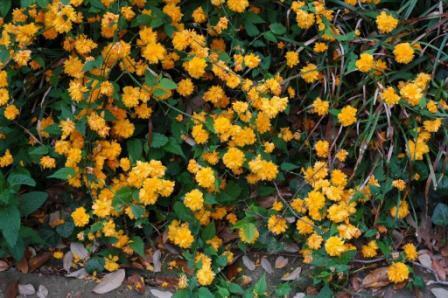 FLOWERS: Produces bright golden-yellow flowers, in April and May and sporadically throughout the summer. 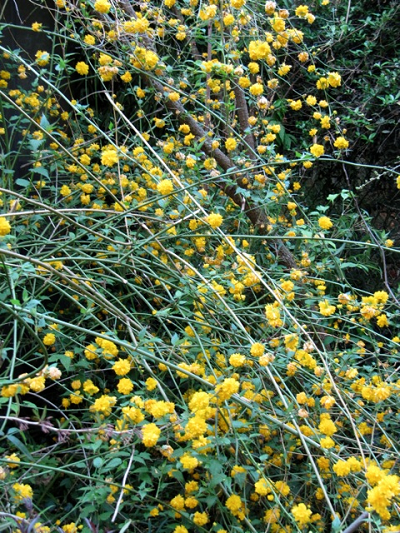 1.5" diameter solitary flowers can be very dense on the stems if in full sun. 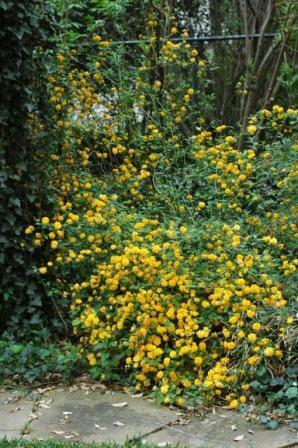 Each golden-yellow flower is effective for two to three weeks and has a good contrast against the green foliage background. Single and doubles available. Flowers tend to bleach out in full sun. Fruit is rare and insignificant. USES: foundation, specimen, group planting, or mass planting shrub, good for naturalizing in the border or in erosion control situations. Good winter stem contrast against red brick or white stone walls medium-fine texture in foliage and very fine-texture when bare open to average density in foliage but thick density when bare (for mature plants).